The wisdom in this writing at first glance seems to be foolishness because it speaks of the potency of non-action, the power of yielding, and the effectiveness of letting things follow their natural course. The teachings of the Tao te Ching are counter-intuitive for most people, but for Westerners they are downright counter-cultural. In our society we bestow all kinds of accolades on people who can make things happen, who can control events and shape surroundings, who can impose their vision and will on others and on the world. In short, for us, pushing is what it’s all about. I probably don’t need to offer up a long list of where our pushing has gotten us: a depleted environment, a devastated economy, unending wars, a democratic process on the brink of collapse and an accelerated pace of life that has left many people literally sick with stress. Thanks to the cross-pollination of cultures made possible by telecommunications and travel, most of us in the West are now familiar with the yin-yang of Eastern thought. We have t-shirts, canvas bags and bumper stickers that tout the black and white yin-yang symbol, but I think on the whole most of us have yet to internalize what the symbol is really teaching: there is an active and a receptive principle, and when the two are out of balance disease and disharmony are the result. I suppose one reason we in the West are so fond of living on the active side of the equation is because we focus so much on the individual and seem to believe that an individual’s worth is determined by how much she or he can “make things happen.” So in order to measure up, we push. We do all we can to make our mark on the world and shape the circumstances around us, but in so doing we fail to behold the beauty and wisdom around us or allow ourselves to be replenished by life itself. When I trace this inclination to push to its origins, though, what I see isn’t egotism, but fear. I suspect that a lot of our pushing comes from a basic lack of trust in Life, the Universe, Source, God, whatever you choose to call it. This fear arises from perceiving ourselves to be separate and on our own. We have to take matters into our own hands and push to make things happen because deep down we believe we’re in it alone. Now, I have a couple of friends who have just given birth, and I am sure they would tell us how necessary it is sometimes to push. And they’d be right–if the pushing is in service to life. When we are in alignment with nature’s cycles, cooperating with them rather than trying to control them, then the pushing will enhance life rather than diminish it. When that occurs it is not really us doing the pushing, but Life pushing through us. This is the non-action the Tao speaks about. Not that we are static beings, but that our activity doesn’t arise from self-will. 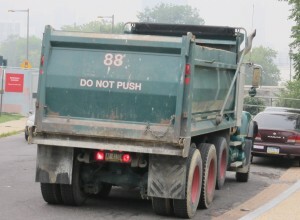 I love that it was a dump truck driving around spreading this Taoist wisdom. Our pushing so often works to our disadvantage, both as individuals and as a society, and it’s something we’d be better off without. So when you find yourself wanting to push, wanting to impose yourself, wanting to control people or circumstances, you might just pause for a moment and notice where the desire comes from. If you trace it down to its roots, what is the fear? Now imagine the freedom you could feel if you let it go. hi patricia – i don’t know why, but i definitely have not been seeing your blogs. if verona hadn’t commented on this, and thus it went to my FB page, i would not have seen this one. do you email these blogs to a list of people? or is FB the only way to see them. if there is an email list, please add my address! and thanks so much for your wisdom and writing. I currently work as a software system designer for Comcast in Philadelphia. My work team designs systems that are sub-divided into various parts and then sub-contracted out to vendors. The vendors design and build all the parts; Comcast puts them together in a big integration lab. Once everything is tested, it’s deployed into the field and customers get our latest new product (like the ability to use the internet to schedule a recording on your home cable box). This entire work process usually takes months, sometimes years for complicated products. A while back an interesting discussion emerged in my work group on whether “pushing” vendors to complete their work is a successful strategy for getting them to finish sooner. My supervisor came up with an interesting answer. He said, “you can push a vendor to deliver something they’ve agreed previously to do for you. All others, ask nicely.” I would add that at Comcast there are some Project Managers who have perfected into an art form the processes of pushing gently and asking nicely. These are the folks that “get stuff done.” They start the waters of activity flowing when the time is right, don’t meddle with well-flowing streams of activity, initiate safety protocols for fast moving rapids, use dynamite to clear logjams from backed-up rivers, drain festering swamps and disturb not the waters under which ferocious beasts reside. Understanding, reacting to and supporting the confluence of all these different streams of activity is what makes for effective management. I love that phrase: “don’t meddle with well-flowing streams of activity”. Wisdom from the corporate world! Thanks, Kip. Thank you, Patricia. This message comes at a good time for me. I am experiencing exactly what you share in this piece about pushing. everything for a week! If that isn’t letting go! So, a clear message came through for me to slow down and stop the pushing. I love the image of the dump truck. Nature also has some beautiful images these days. Isn’t that something how we are forced sometimes to slow down? And amen to that last sentence. Nature has so much to teach us about letting things follow their natural course! To allow the warm waters of the universe to support you and not resist…to trust something so fluid will keep you from sinking…ah, faith. Ah, not doing but being. Learning, with every ouch. Kathleen, thanks for your comments. Indeed, this learning to trust is a life long process!